LOOKING FOR SOMETHING DIFFERENT FOR YOUR FENCE? A Fence Utah is a fence installation company with vast experience within the property maintenance industry. Having one of the best service records in the industry, we are firmly committed to providing all our clients with the finest fencing options and services available in Utah. For individuals looking for premium fencing options at great rates, we suggest Trex style fences. You can never overestimate the effect a fence can have on the general aesthetic of a property. Determining the kind of fencing style that is perfectly compatible with your property can sometimes be a difficult task. Every fencing style has its own advantages and disadvantages. There are very few fencing options available on the market that seem to tick all the right boxes. Trex fencing is one of our most popular fencing styles. Despite what some might say, vinyl, wood, and metal fencing all require individuals to frequently maintain them so that they remain in optimal condition. For individuals who do not want to spend the time and effort in maintaining their fences, there is Trex fencing. Trex fences have become immensely popular because they add a contemporary feel to a property. Like other kinds of styles, Trex fences can also come in various custom designs. Individuals who choose Trex style fencing can benefit from a number of advantages. Is extremely durable and lasts much longer than other kinds of fencing styles. Does not splinter, chip, peel, or rust. Adds immense value to your property. Is extremely easy and quick to install. Is very strong, sturdy and secure. Offers a unique and modern aesthetic appeal. Is available in a variety of color shades. 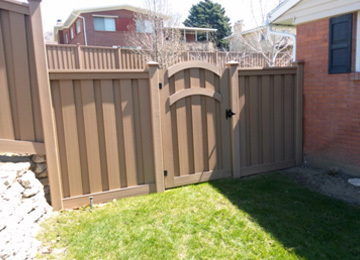 If you are in the market for a high quality fence, A Fence Utah can help. We believe in developing lasting relationships with all our customers by providing durable, high end products at affordable prices. Contact us now to learn more about our variety of fence styles.